From antiques to modern merchandise, brand name products to counterfeits, Beijing markets have them all. Tourists have always considered Beijing to be a treasure cave, selling products of every purpose, brand and function. To many people, these markets are also centers for haggling; obeying the laws of supply and demand, merchants and customers treat the Beijing markets as a bargaining arena. Numerous shopping centers offer entertainment as well, including bands and fashion shows. SOGO and Chung-yo are examples of traditional shopping centers, while Wangfujing and Xidan are Beijing's newly-renovated modern malls. Of course, you can also take a shot at the countless vendors out in the open-air market. Wangfujing is Beijing's most famous and historic market place. Although this street is only one kilometer long, it is lined with stores and countless people. The most established store here is the Beijing Department Store, but others include the largest arts and crafts shop, Dong'an Market, the largest Xinhua Bookstore, the newly-made and largest store-Oriental Plaza, and many, many more. Shops from different countries can be found here as well. Basically, you can shop forever, or, at least until your wallet turns empty! 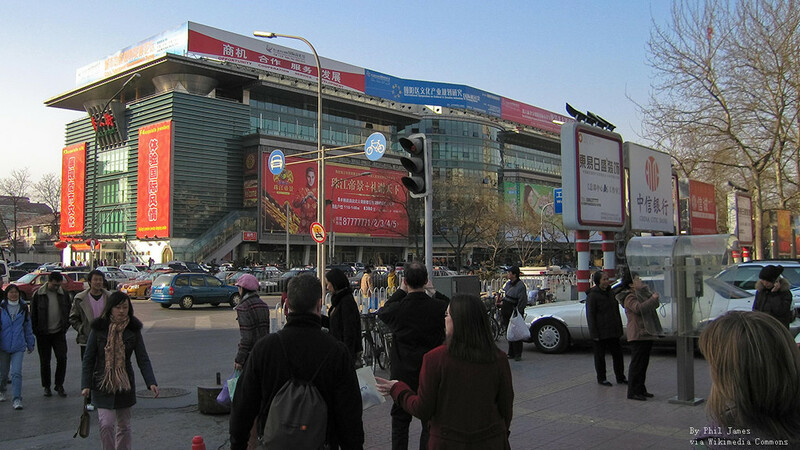 Xidan is a very large market place, similar to Wangfujing. 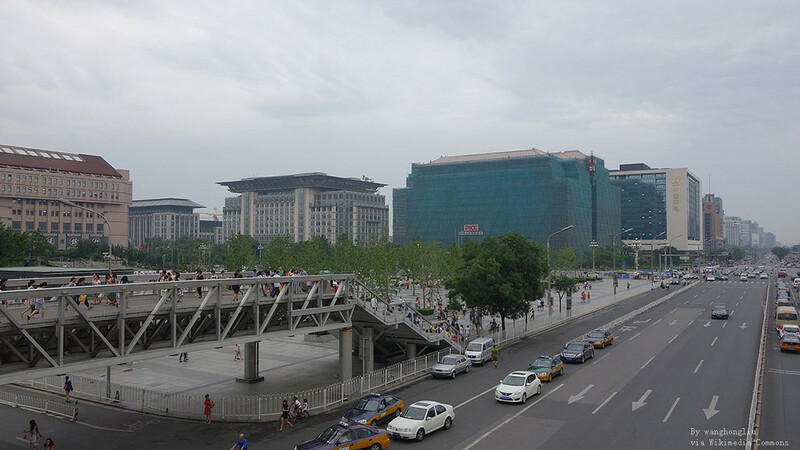 Located very close to Tian'anmen Square, Xidan is a shopping mecca for more Beijing residents than tourists. There are many malls that are similar to multi-level department stores found inUnited States. Consumer goods of every kind, such as electronics, clothing and food, are sold here at cheaper prices than those at Wangfujing. 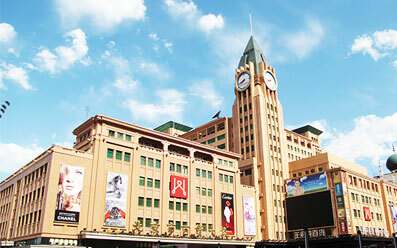 The Grand Pacific is one of the largest department stores in Beijing,and it exclusively sells fashionable products. Also, stores in the subway are opening; due to the variety of fashionable options, Xidan is very popular among the younger generations. Time Plaza is the most expensive store, selling high priced brand name products; because of this, this store is most likely the least- crowded store at Xidan. Unlike what its name says, the Silk Market offer a lot more than just silk. Selling cashmere garments, jackets, leather goods, shoes, hats, watches and souvenirs of brand name companies or counterfeits, this market is the haven for bargaining. Anyone shopping here should immediately haggle with a starting price of at least 50-70% of the original. If merchants remain stubborn, do not be afraid to simply walk away because there are many other vendors selling the exact same product. Most likely, the stubborn merchant will call you back anyway. The Silk Market is a perfect location for tourists are interested in Chinese markets; most people are fairly fluent with English too. Just keep an eye out for persuasive vendors and counterfeit goods! Located on Sanlitun Lu near the embassies, the Yaxiu Market is similar to the Silk Market. With not quite as many counterfeits, this location is an indoor four-story store that especially specializes in clothing. Full of designer goods along with some souvenirs and such, Yzxiu Market hires skilled tailors who measure and fit you with genuine made-to-order Chinese clothing, which can be completed in one or two days. The market is open daily from 9:30 am to 9:00 pm. The famous Liulichang street has existed since the Qing Dynasty. All throughout Ming and Qing Dynasties, Liulichang was a gathering site for scholars, painters and calligraphers to write, compile and exchange each other's works. It was the location where those who failed the imperial examination exchanged old study books and inkslabs. Later, Liulichang slowly evolved into a market place for traditional Chinese paintings, old wood block-print books, Chinese ink brushes, inkslabs, paper, and calligraphy. Today, there are over 100 stores dedicated to selling these various articles and antiques. Rongbaozhai ,which has with-stood 300 years of history, is now the prominent store on Liulichan Street. Beijing's flea market has one of the most assorted collections of products. Nicknamed the “Dirt Market,” the flea market is only open during weekends, where hundreds of merchants come to display their interesting goods. 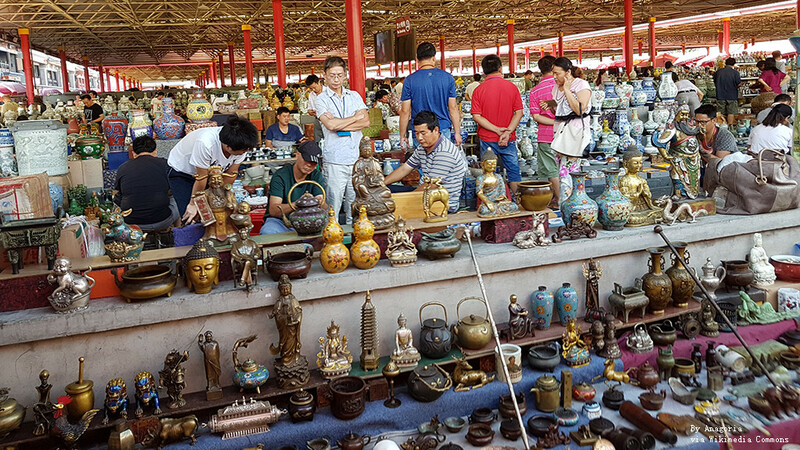 Ranging from instruments, pictures, and utensils to antiques, pottery, and even door knobs, this “Dirt Market” literally sells some of everything. The variety does include some materials, which you may consider “trash” but the high numbers of customers make this flea market a festive location. A good taste of a Beijing business can be obtained here as long as you are alert for any scams.